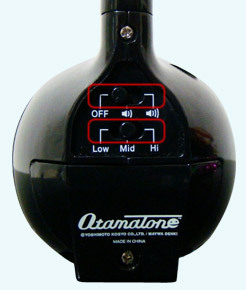 The Otomatone is the musical instrument created by toy company CUBE Works and Maywa Denki. 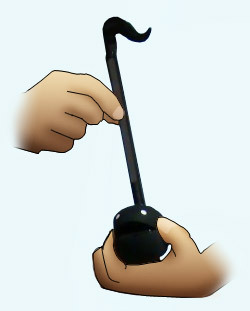 Otamatone is shaped like a musical note and sounds like thermin. As you can see on the fig. 01, you have to use both of your hands to play Otamatone. To produce sound you have to tap or slide your finger up and down the neck (fig. 01). With this you can change pitch of the note or create vibrato effect by shaking hand. You can also adjust the pitch by squeezing the face at the bottom of the tadpole (fig. 02) to open and close the mouth. See the video section to find out how it works. You can also find there an introduction by Nobumichi Tosa himself. With two hands you can play practically every melody you want whitin range of one octave. You can change octave in three grades (fig. 03) low-mid-hi by sliding lower slider. 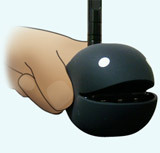 With upper slidder you can either turn off/on Otamatone or increase volume of Otamatone speaker.